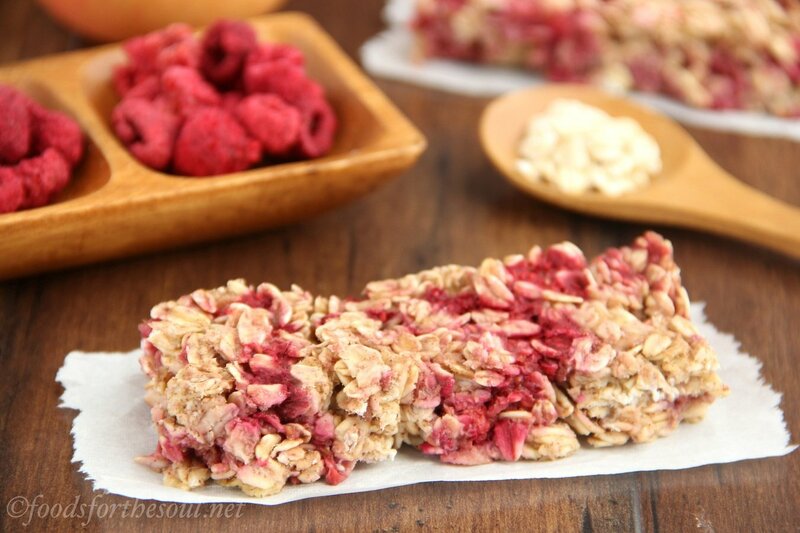 An easy recipe for healthy soft & chewy granola bars packed full of fruit! 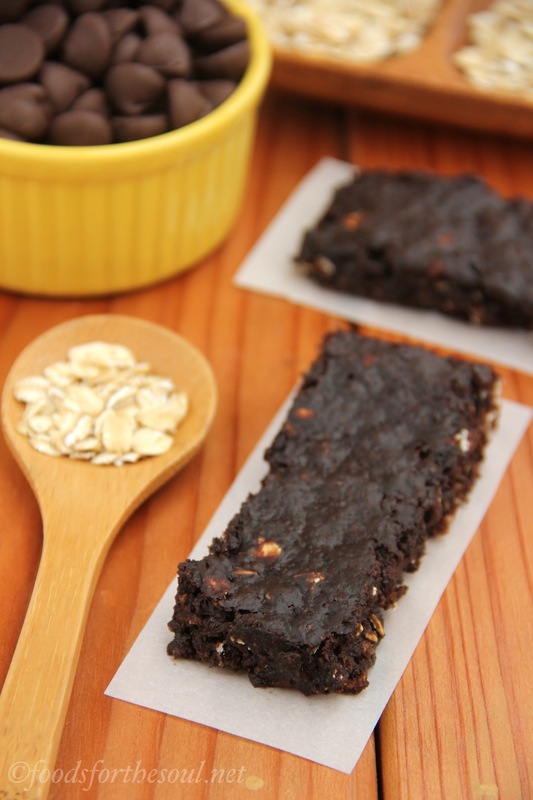 Only 100 calories and made without butter, refined flour or refined sugar. On Wednesday morning, I awoke to the gentle pitter-patter of raindrops gently hitting my window. I sighed, pulling the covers up to my chin and seriously contemplating whether I could spend the entire day in bed. Less than 24 hours earlier, the sun had been shining so brightly that our outdoor thermometer read 70° and I had pulled on a pair of short for the first time this year! The dismal gray clouds quickly seeped into my mood, and by lunchtime, I was practically ready to move to Hawaii! (Well, slight exaggeration. But only slight.) While pouting and editing photos at my desk, I felt my cell phone vibrate next to my elbow. I glanced down at the notification, halfway expecting to see a forgotten text or Twitter alert, and did a double-take. A smile crept across my face and I slowly began bouncing up and down in my chair like a little kid on her birthday. Spring Training had officially started… Baseball is back!! Completely forgetting about the torrential downpours outside, I gleefully texted two of my friends—old coworkers from my previous job—the exciting news. Despite each of us going our separate ways (one to Industry, one to a Post-Doc, and me to blogging), we still stayed in touch, mainly because of our shared fanaticism for baseball. For the next 20 minutes, messages flew back and forth: a bit of banter, a little teasing, and a lot of catching up. We’d barely talked since the Red Sox won the World Series in October! By the time the thunder threatened to start rattling the windowpanes, my cheekbones hurt a little from so much smiling. Baseball always brightens my day! 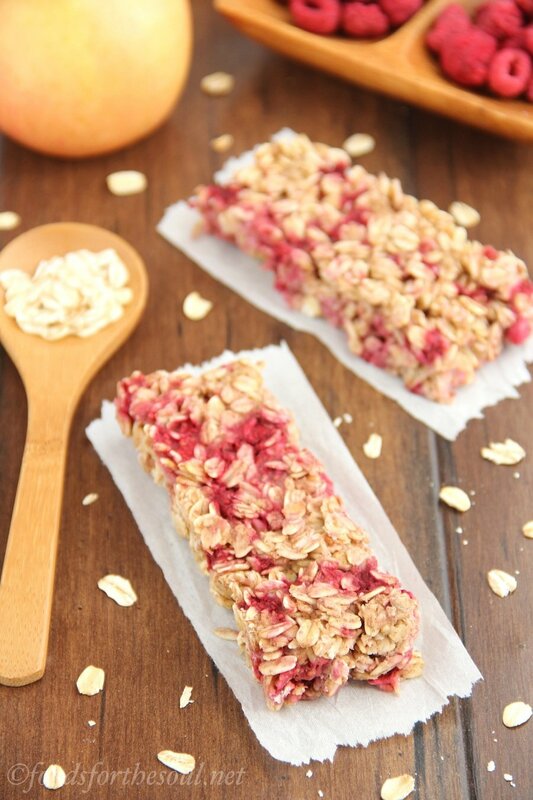 These low fat granola bars begin with old-fashioned oats. Compared to instant oats, old-fashioned oats are heartier with a little more chew, so they provide the perfect soft-baked texture. Use gluten-free oats, if necessary; they won’t affect the texture or taste. 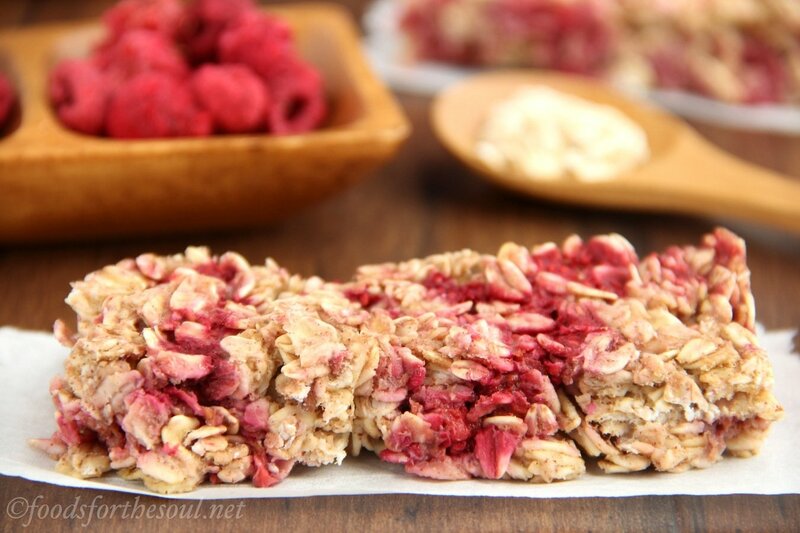 I opted for frozen unsweetened raspberries, which means you can easily make these granola bars all year round! Try to find organic ones, if possible; with slightly better quality, they usually taste a little fresher. 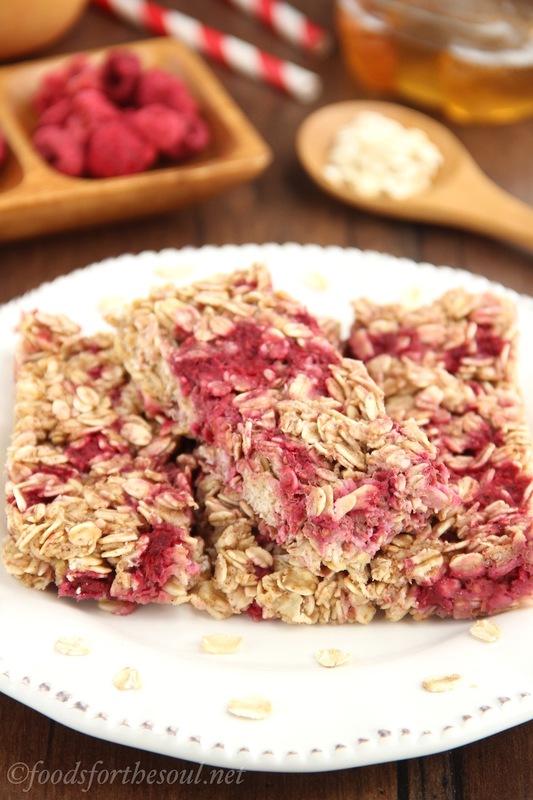 Some grocery stores only stock frozen sweetened raspberries, but avoid those! They contain a lot of excess sugar, so I’d recommend substituting a frozen unsweetened berry blend instead. To create the liquid “binder,” you’ll stir together melted coconut oil, unsweetened applesauce, milk, honey, and cinnamon. Make sure the applesauce warms up to room temperature before adding it to the coconut oil! Because of its really low melting point, coconut oil will quickly re-solidify if mixed with any chilled ingredients. 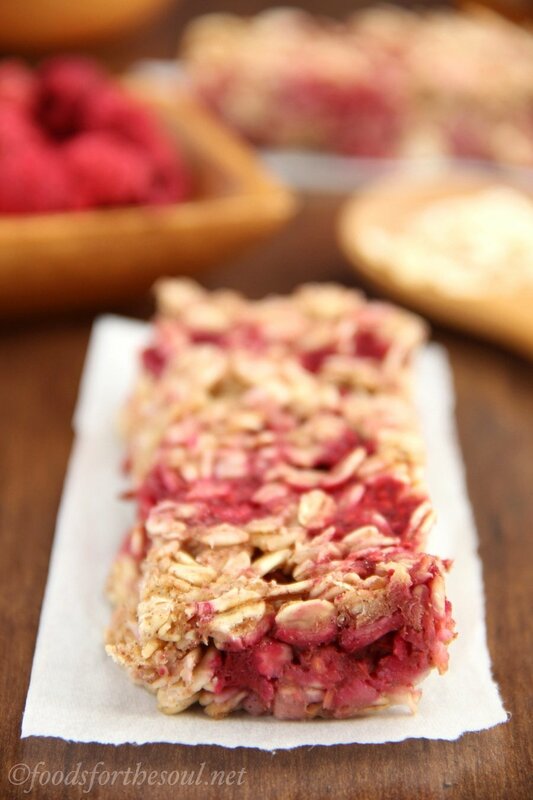 And while warm cinnamon and tart raspberries may sound like a strange flavor combination, it’s absolutely addictive—I had to hide these bars in the back of my fridge to stop myself from downing half the pan in one day! 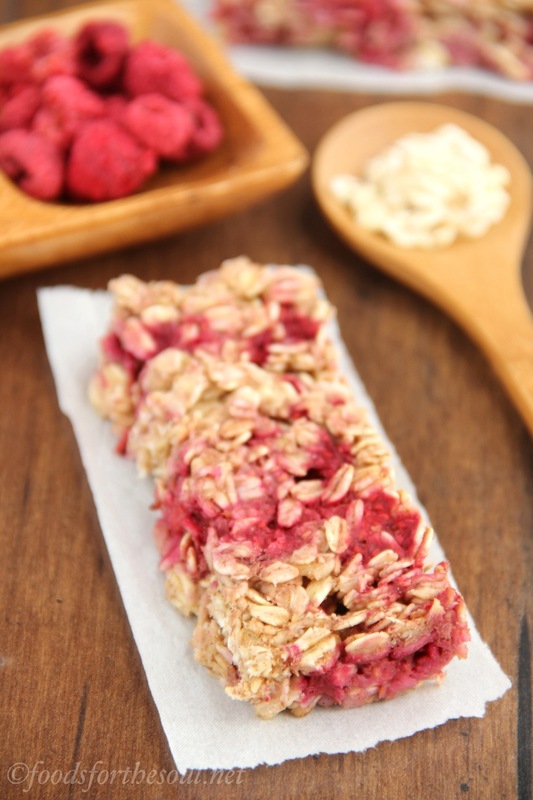 To whip up these snacks, simply mix together the liquid ingredients and stir in the oats until they’re evenly coated. Because the milk and applesauce act as glue to hold everything together, it’s really important that all of the oats are covered with the mixture to prevent the granola bars from falling apart. 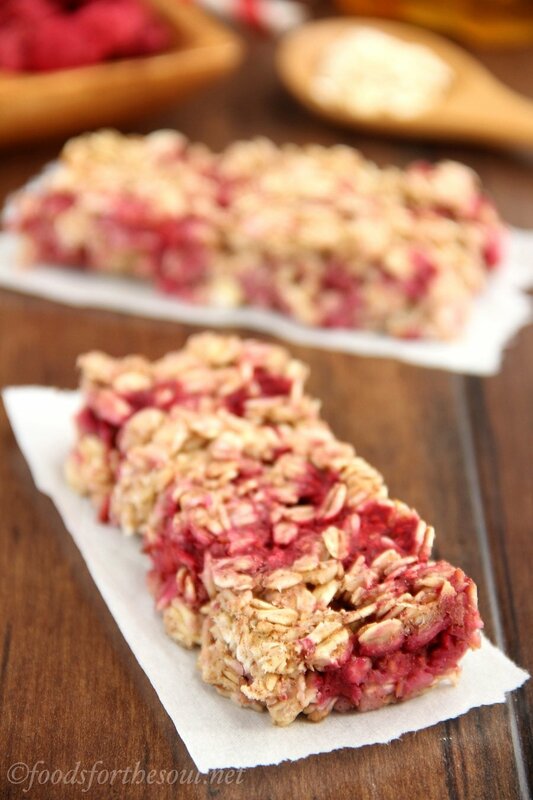 Then fold in the raspberries, as gently as possible to minimize their bleeding, and press into the pan to bake! Mine finished with the perfect chewy texture after 17 minutes. The center may look slightly underdone, but warm pan will continue to cook it through as they cool to room temperature. Don’t those bright splashes of pink look so pretty? 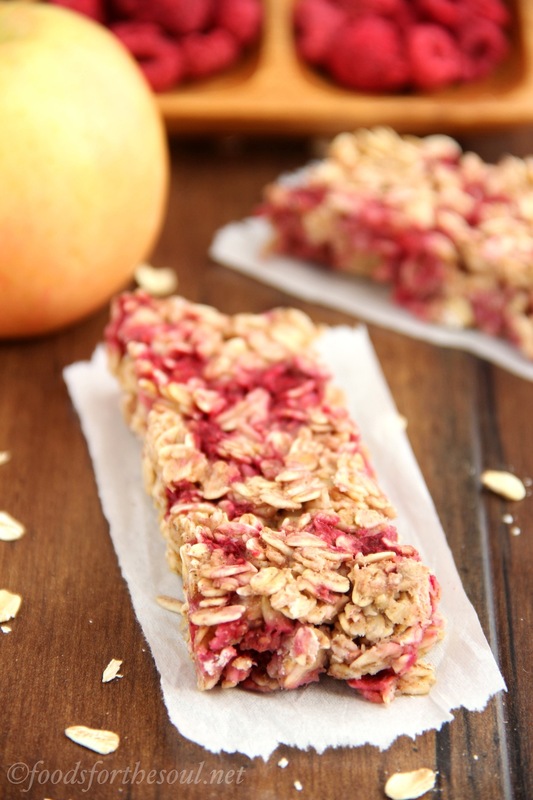 Bursting with an irresistible combination of tart raspberries, sweet applesauce, and warm cinnamon, these Chewy Raspberry Apple Granola Bars are a delicious mid-morning or late-afternoon pick-me-up. Slip one into your child’s lunchbox for school, or sneak one after dinner for a little sweet treat. With only 100 calories and NO refined sugar, you won’t feel guilty at all! 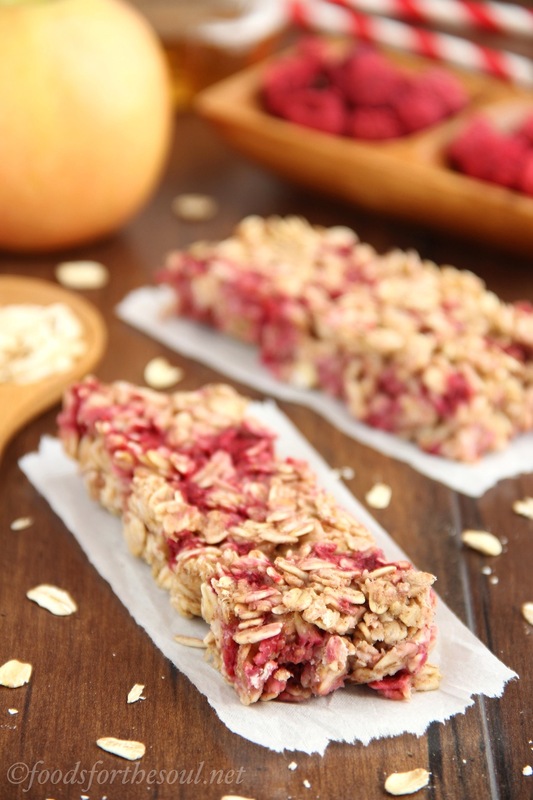 These wholesome snack bars are so easy to make and full of bright fruit flavors. 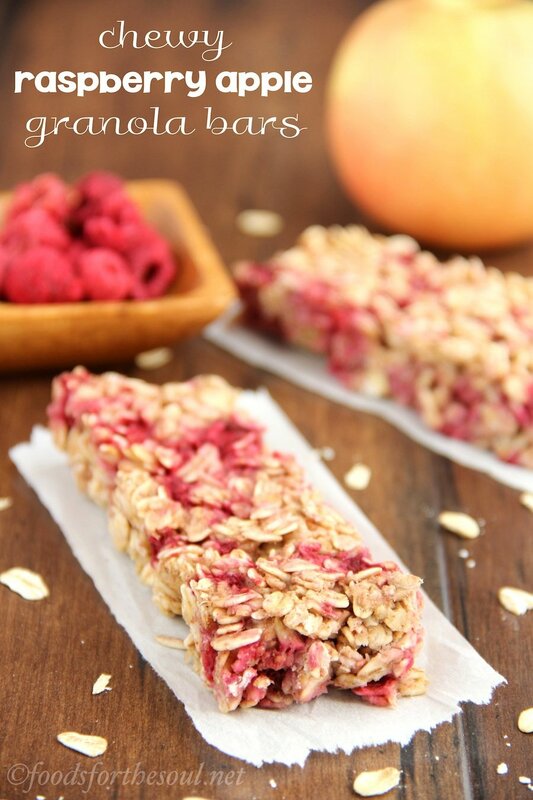 They’re a great healthy option for breakfast, snacks, or even dessert! In a large bowl, stir together the oil and applesauce until smooth. Mix in the milk, honey and cinnamon until thoroughly combined. Stir in the oats until evenly coated with the applesauce mixture. Gently fold in the raspberries. 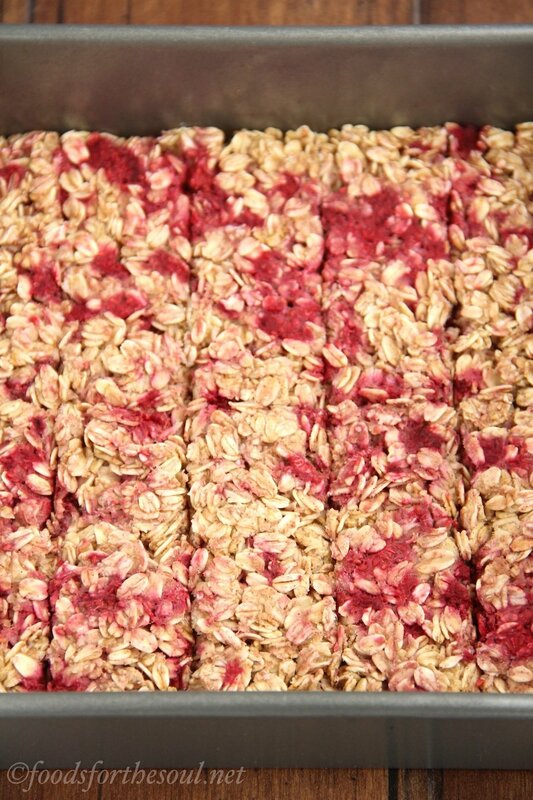 Press the oat mixture into the prepared pan, and bake at 350°F for 16-19 minutes. Cool completely to room temperature in the pan before slicing into 10 bars. Notes: For a vegan version, substitute your favorite non-dairy milk and agave in place of the honey. It’s important for the applesauce to be at room temperature to prevent the melted coconut oil from re-solidifying. For best storage results, tightly wrap each individual bar in plastic wrap and store in the refrigerator until ready to eat. Hi there, I made these tonight- was so happy I had all the ingredients at home! I’m not sure if it turned out right though- it’s kind of chewy but kind of stodgy- a bit like cooked porridge rather than chewy granola bar. I quite like the flavour though, and the rasperries are delicious! I weighed the oats and didn’t make any substitutions. My tin is slightly bigger than your dimensions, and I doubled the recipe because 10 didnt’ seem like enough 🙂 I cooked it for 25 mins (to allow for the bigger batch size…) Thanks! 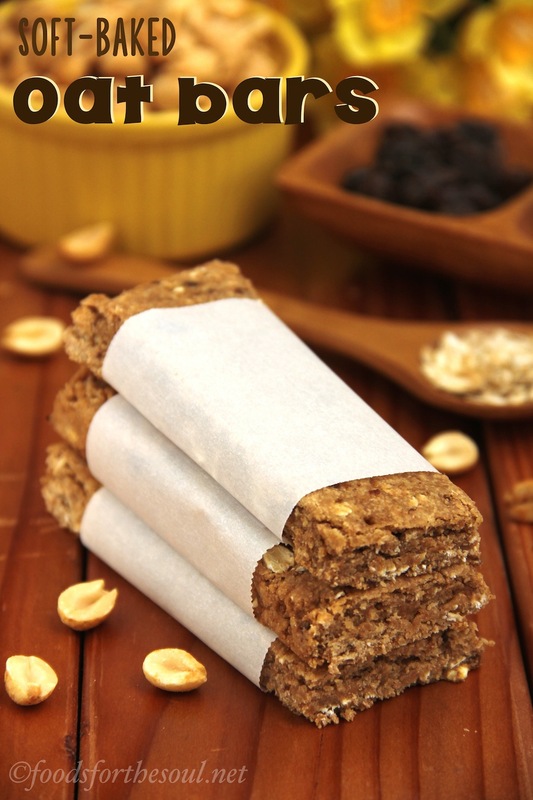 i was wondering if you would tell me how many grams of fat, sugar, protein, and carbs are in these granola bars. That information is actually included directly beneath the recipe! It can be easy to miss. 🙂 I can’t wait to hear what you think of these granola bars Maria! Hi, I made these tonight and they came out amazing! I do like things on the sweeter side, so did drizzle mine with alittle honey (right before eating) . My husband loved these as is and ate his without added honey. I will definitely be making these again. Thank you so much for sharing this recipe! We recently turned to a gluten & dairy free diet and it’s been a struggle finding good recipes! I do have one question, bc I’m debating to add this the next time I make this recipe. Have your tried adding salt to this recipe? I was thinking the flavor might pop alittle with alittle salt added. I’m still kind of new to baking (stuff like this) so don’t know what’s a good amount of salt to even add. 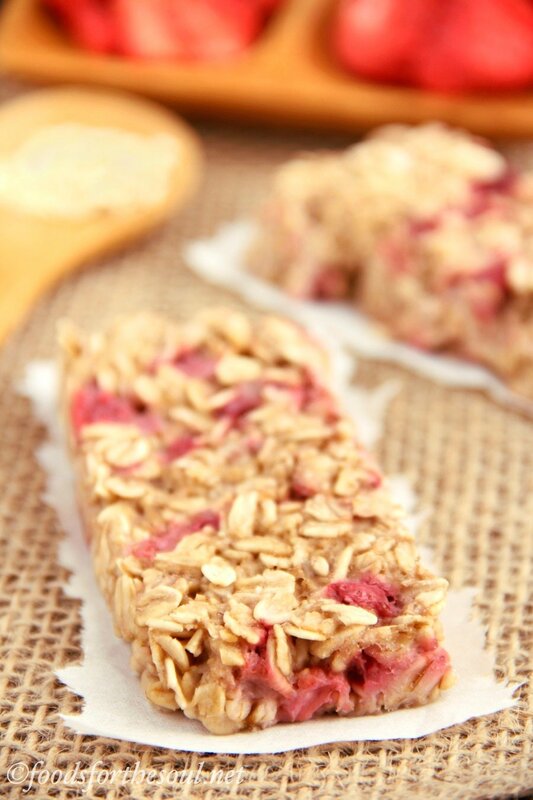 I’m so glad you and your husband enjoyed these granola bars Carolyn! That means so much to me that you already plan on making them again. What a huge compliment — thank you! I think adding salt is a great idea. I’d recommend ¼ teaspoon to start (or ½ teaspoon, if you’re like me and love a strong salt pop!). 🙂 In case it’s useful, you can find all of my gluten-free recipes here! (Or by clicking at the “Recipes” tab in the pink menu bar at the top of my blog and scrolling down until you see “Gluten-Free.”) I’d love to hear what you think of any other of my recipes you decide to try!